It's November and it is time to boost your immune system and embrace the chillier weather. This edition of the Dr. Joey newsletter is all about the things we love – great foods, incredible before and after success stories, delicious recipes and a few fun products for your home and/or office. Stay tuned for a few exciting announcements coming next month and in January – I assure you – you don't want to miss it! If you have any comments or products you would like to share with the Dr. Joey team, simply e-mail us at drjoey@drjoey.com - we would love to hear from you! Did you miss Dr. Joey talking about food sensitivities on CityLine? Did you hear all programs at Shulman Weight Loss are 10% off just for the month of November – click here to view some belly fat busting results. 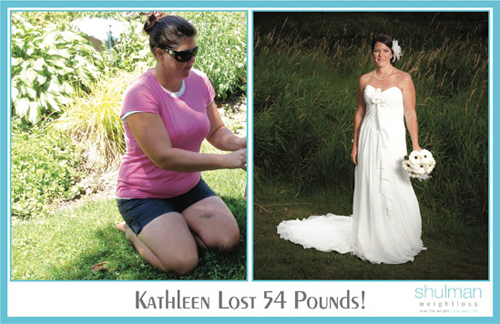 And... congratulations to Kathleen who lost 54 pounds at Shulman Weight Loss London – you make the most beautiful bride! Woolwich Dairy's Chevrai – I admit – my entire family is crazy about goat's cheese. On toast, in salads, omelets, in rice and even as ice cream – we simply cannot get enough! In addition to the great taste goat's cheese adds to any dish, its health benefits are numerous. Goat's cheese is highly digestible (with less lactose) and has only 70 calories with 5 whopping grams of protein per ounce. When shopping for your goat's cheese – look for the name Woolwich. Woolwich diary offers a variety of flavours including roasted garlic, fine herb and cranberry cinnamon – definitely a great option to have on hand as holiday entertaining begins. For more information, please visit www.woolwichdairy.com. iOGO Yogurt - At 35 calories and 3 grams of protein per serving, this fat free, yogurt has caught our attention! As a great option for breakfast or an "on the go" snack, add in some fresh fruit and granola – and you will be 100% satisfied. With a variety of flavors to choose from, you are bound to find one that you absolutely love. Benourished Juices – Be nourished juices are made with organic and local ingredients to bring together a refreshing juice that is satisfying and nutritious. These dairy-free, gluten-free and raw juices are great to keep in the fridge at work or at home. There are six amazing juices to choose from including Almond Bliss, Digestive Express, Green Alkalizer, Green Envy, Hangover Helper and Zesty Lemonade. Jurlique Moisturizing Hand Sanitizer – Cold and flu season is upon us again and it is time to bring out the hand sanitizer's. Jurlique offers a great hand sanitizer that does not leave your hands feeling dry and smelling of alcohol. The oils leave your hands moisturized and smooth and you are left with a pleasant, natural smell. You can get a larger pump bottle to keep on your desk at work or at home, or you can get a travel size bottle to throw in your purse. We love goat's cheese for all the nutrition and benefits it has to offer. Not only is it higher in protein and lower in fat and calories compared to other cheeses, it has a distinct flavour and texture that keeps us coming back for more. In addition to its nutritional benefits, this cheese is much more easily digestible since it contains smaller fat globules than other cheese products. People who are lactose intolerant may find that they can digest and tolerate goat's cheese! Toss with balsamic vinegar and olive oil, season with a pinch of salt and pepper. Divide salad amongst two plates and top each salad with half of the goat cheese and walnuts. Reheat top with goat's cheese. After removing squash from the oven, scrape out the inside with a fork until the flesh resembles spaghetti pasta. Place the squash in a bowl and toss with the goat cheese and fresh herbs while still warm. Divide the servings and serve immediately. Makes a great alternative to pasta. Super Immunity by Joel Fuhrman, M.D., is a must read for those of you looking to boost your immune system this cold and flu season. This book outlines simple and effective ways to increase your immunity to help your body fight against the common cold and flu. We want to congratulate our client Kanina on losing 30 pounds! Kanina felt so good she recently ran her first 1/2 marathon! "Dr. Joey and I have worked together from a distance. I'm in Ottawa and my meetings are all done through Skype calls. This has actually worked really well in terms of scheduling and I've still felt connected to both Dr. Joey and the program. Since losing the weight, I have a lot more energy and my immune system is much better. I was even able to run my fastest ever half-marathon in September, shaving off 10 minutes from my time! 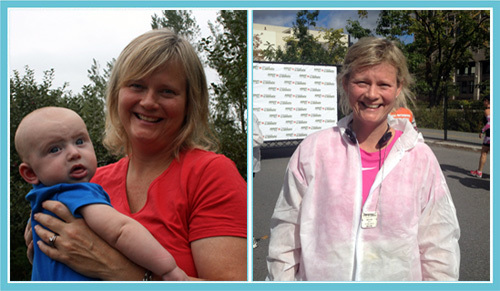 With two small kids and a demanding job, losing the weight has made a huge difference!" If you would like to book your free weight loss assessment with Dr. Joey- please call 905.889.5326 or e-mail inquiries@shulmanweightloss.com for our Thornhill, Yorkville or London locations!